Rachel Maddow was born today, April 1, in 1973. is an American television host, liberal political commentator, and author. Maddow hosts a nightly television show, The Rachel Maddow Show, on MSNBC, and serves as the cable network's special event co-anchor alongside Brian Williams. Her syndicated talk radio program of the same name aired on Air America Radio. Maddow became the first openly gay anchor to host a major prime-time news program in the United States. She holds a doctorate in politics from the University of Oxford. Asked about her political views by the Valley Advocate, Maddow replied, "I'm undoubtedly a liberal, which means that I'm in almost total agreement with the Eisenhower-era Republican party platform." 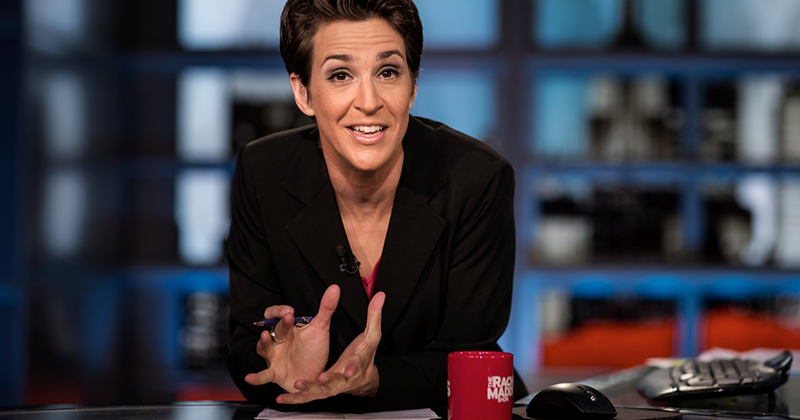 Rachel Anne Maddow was born in Castro Valley, California. Maddow has stated that her family is "very, very Catholic" and she grew up in a community that her mother has described as "very conservative." Maddow was a competitive athlete and participated in high school volleyball, basketball, and swimming. Referencing John Hughes films, she has described herself as being "a cross between the jock and the antisocial girl" in high school. A graduate of Castro Valley High School, she attended Stanford University. While a freshman, she was outed as a lesbian by the college newspaper when an interview with her was published before she could tell her parents. She earned a degree in public policy at Stanford in 1994. At graduation, she was awarded the John Gardner Fellowship. She was the recipient of a Rhodes Scholarship and began her postgraduate study in 1995 at Lincoln College, Oxford. She had also been awarded a Marshall Scholarship the same year but turned it down in favour of the Rhodes. This made her the first openly gay or lesbian American to win an international Rhodes Scholarship. In 2001, she earned a Doctor of Philosophy (DPhil) in politics at the University of Oxford. Her thesis is titled HIV/AIDS and Health Care Reform in British and American Prisons. Maddow's first radio hosting job was in 1999 WRNX (100.9 FM) in Holyoke, Massachusetts. She entered and won a contest the station held to find a new sidekick for the show's host, Dave Brinnel. She went on to host Big Breakfast on WRSI in Northampton, Massachusetts, for 2 years. She left the show in 2004 to join the new Air America. There she hosted Unfiltered along with Chuck D (of the hip hop group Public Enemy) and Lizz Winstead (co-creator of The Daily Show) until its cancellation in March 2005. Two weeks after the cancellation of Unfiltered in April 2005, The Rachel Maddow Show, began airing. In June 2005, Maddow became a regular panelist on the MSNBC show Tucker. During and after the November 2006 election, she was a guest on CNN's Paula Zahn Now; she was also a correspondent for The Advocate News magazine, an LGBT-oriented short-form news magazine for Logo deriving from news items published by The Advocate. In January 2008, Maddow became an MSNBC political analyst and was a regular panelist on MSNBC's Race for the White House with David Gregory and MSNBC's election coverage as well as a frequent contributor on Countdown with Keith Olbermann. 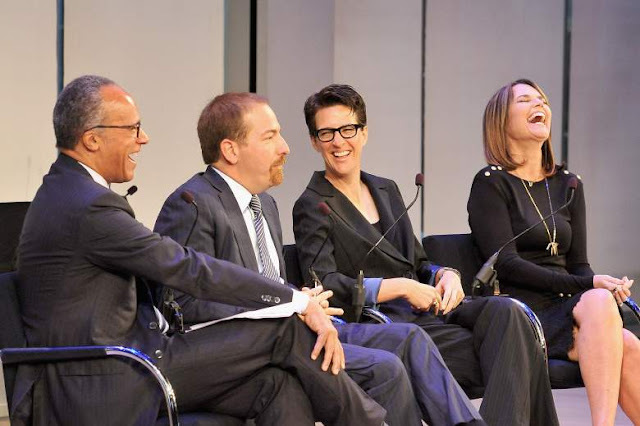 In 2008, Maddow was the substitute host for Countdown with Keith Olbermann, her first time hosting a program on MSNBC. Maddow described herself on air as "nervous." Keith Olbermann complimented her work, and she was brought back to host Countdown the next month. The show she hosted was the highest-rated news program among people aged 25 to 54. For her success, Olbermann ranked Maddow third in his show's segment "World's Best Persons." In July 2008, Maddow filled in again for several broadcasts. Maddow also filled in for David Gregory as host of Race for the White House. In mid-May 2017, amid multiple controversies surrounding the Trump administration, MSNBC topped the news ratings, surpassing CNN and Fox News. For the week of May 15, The Rachel Maddow Show was the No. 1 non-sports program on cable for the first time. She has been called "America's wonkiest anchor" who "cut through the chaos of the Trump administration – and became the most trusted name in the news." Maddow has argued that these issues "are the most serious scandals that any president has ever faced." Maddow wrote Drift: The Unmooring of American Military Power (2012) about the role of the military in postwar American politics. Upon its release, Drift topped The New York Times Best Sellers list for hardcover nonfiction. In December 2013, The Washington Post announced that Maddow would write a monthly opinion column for the paper, contributing one article per month over a period of 6 months. Maddow splits her time between New York and West Cummington, Massachusetts with her partner, artist Susan Mikula (right). They met in 1999, when Maddow was working on her doctoral dissertation. Maddow said "There are three things I do to stay sane: I exercise, I sleep – I'm a good sleeper – and I fish."